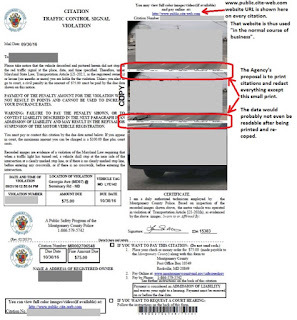 Documents obtained by the Maryland Drivers Alliance reveal that the Montgomery County Government has made false or highly misleading statements to a state compliance board in response to a complaint filed by the editor of this website. 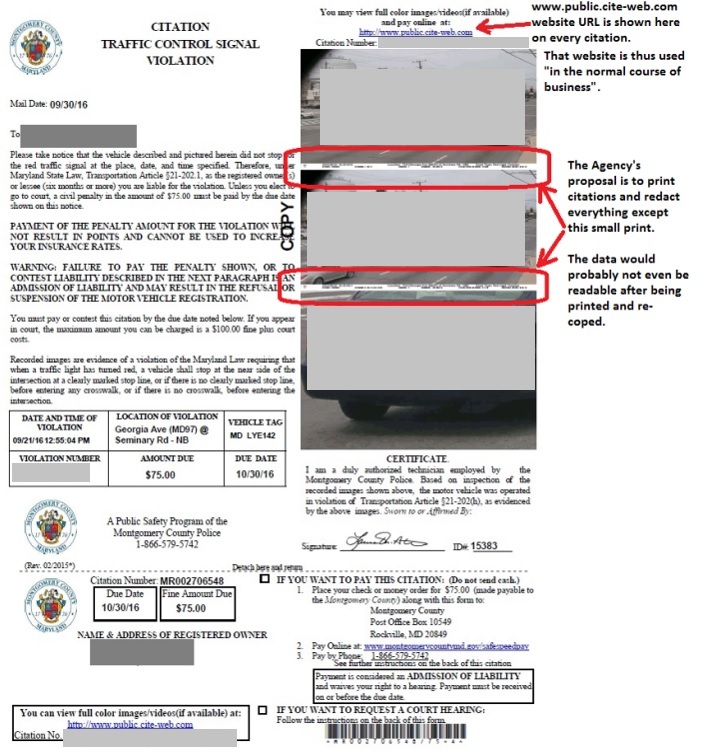 The Montgomery County Police Department repeated stated to the Maryland Public Information Act Compliance board that certain records sought by the editor of the Maryland Drivers Alliance website did not exist and were not located within a database, and thus could not be produced without performing a manual search costing tens of thousands of dollars and requiring months of time. These statements was made repeatedly to the board by Montgomery County, however the county's vendor confirmed in a letter whether the requested data existed in a database by responding "yes we do have access to that information" and confirmed that it is retrievable in a searchable electronic format for far less effort than the manual process the county had stated. The records were requested to investigate a concern about the duration of yellow lights at an intersection on a state highway in Montgomery County where red light cameras were used. 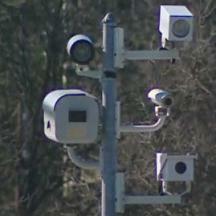 The editor of the Maryland Drivers Alliance website (Ron Ely), filed a Maryland Public Information Act request for a small set of records revealing the Yellow Time, "Red Time", speed limit, and other information which is recorded by red light cameras and which is available to recipients of red light camera tickets on a website (public.cite-web.com). The county denied the request, stating that the data existed only on citation images and this was not disclosable. We repeated our request, this time clarifying that the data was located on a website, not images, and also agreeing to remove some data from out request. Montgomery County Automated Enforcement Manager Richard Hetherington again denied our request. We submitted a new request, this time specifically requesting the data from a database and referencing a specific portion of the Public Information Act, GP §4-205(c)(5) which states : "If a public record exists in a searchable and analyzable electronic format, the act of a custodian providing a portion of the public record in a searchable and analyzable electronic format does not constitute creating a new public record." This provision was added to the MPIA in 2011 for the specific purpose of allowing public access to records stored in a database. The county responded that they would only produce the documents in the form of printing over 5000 individual citations and redacting all information EXCEPT the requested information, that this would require over 700 hours of time and that the fee for doing so would be $19,310.24. The requested information does appears on citations underneath "thumbnail" images on citations, in font so small that it is barely visible on original citations and would likely not be readable at all after citations were redacted and re-copied. The agency furthermore stated that the request would not be satisfied for 18 weeks, despite the fact that the MPIA requires documents to be produced within 30 days, or up to 60 days only if the requester agrees to a request for an extension. Ely filed a complaint with the Maryland Public Information Act Compliance Board, which has authority to review "excessive fees" over $350. In their written response to Compliance Board, Montgomery County stated: "The information that Mr Ely is seeking is embedded in a photograph as a type of time stamp" and "The third allegation that Mr Ely makes it the amount of time required to complete the task he is requesting....What he has failed to acknowledge, in both our written and oral conversations, is that the information he is seeking is not stored in a database format." The county furthermore stated that they lacked the "capacity" to extract data from databases. In our reply to this, we specifically pointed out that our request was specifically NOT for the production of citations, and that the data we requested was located on a website in a tabular format rather than as an "image" or embedded document. We provided technical details which demonstrated that it was impossible for this data to be stored only in citation images given the way it was rendered, including providing the output HTML of the website and describing the technology used to render the data and that this could only be done if the data was stored in a searchable and analyzable format such as a database. However Montgomery County repeated their claim that the data did not exist in a database: "Therefore, once again, the citations that were generated by violations that occurred during the window that he is requesting are the records he is seeking" (despite the fact we had clearly stated they were not) "Neither the County nor Xerox State and Local Solutions has a need to shore this information in a data base that can be queried or searched as it is not", a statement they made despite the fact that the ww.public.cite-web.com website is included on citations as the means by which ticket recipients can view the data we requested. The requested data would reveal significant information relevant to public safety, such as whether or not the county's failure to conform to a State Highway Administration policy requiring all yellow lights to be set to a minimum of 3.5 seconds resulted in a higher rate of red light running. However in their filings Montgomery County repeatedly argued there was no "public interest" in the disclosure of this information, casting aspersions against Mr Ely's character and professional abilities and against a reporter who had separately investigated the issue of these yellow light times in the process. In a teleconference meeting of the MPIA compliance on January 9th, Montgomery County repeated their assertion that the citations were the only format in which the requested data was maintained and that the data did not exist in a database, and claimed that the raw information used to generate citations was not retained after citations were issued. Mr Ely referred back to another statement made by the County in their filing to the board: "Our system, on the citation in question, registers a time of 2.997". The "yellow time" as shown on the citation being discussed was 2.9, with only 2 decimal places of precision. It is technically impossible for a value with 4 digits of precision to be read from the citations which only showed 2 digits. When confronted by a board member about when the vendor gave them this information, ATEU manager Mr Hetherington eventually acknowledged that this was after they had received the public information act request... a request which had been sent weeks after the citation was issued. The board requested that the County ask their vendor whether the requested data existed in a database. The Vendor responded : "In response to the letter dated Jan 11th, 2017, in which there was a request on if the information pertaining to the Yellow Time, Speed Limit, and Red Time data is stored in a database, the answer is we do have access to this information". The vendor furthermore stated that it would take 18 hours to "produce a query" that would extract the information, far less than the over 700 hours the agency proposed in their response to our request, indicating that the vendor clearly has the "capacity" to extract records. However the Montgomery County Government remained unapologetic and adamant in their position despite the fact that their statements that the data was not electronically retrievable had been proven false. The county continues to assert that they had no obligation to extract the electronic records and disclose them despite any decision the board might make. The Associate County Attorney wrote "First, the creation of this database is the creation of a record, which the MPIA specifically says the County does not have to do." (a statement made the fact that the vendor acknowledge already having access to the information in a database.) "Secondly, the creation of this record would be completely outside the scope of the issue before the Board, as the issue before them is whether the $19,000.00 fee is reasonable. Third, neither the vendor nor the County have any use for this record, and the only reason that the County inquired with the vendor was due to a request by the Board. However, that inquiry should not in any way act as an agreement by the County that we are going to create a new record to comply with this MPIA request. " The MPIA explicitly says that extracting records from a searchable and analyzable format is NOT "creating a new record". The matter is still pending a decision by the Public Information Act Compliance Board.